Rebecca + Andrew, a photo by The Bacher Family on Flickr. On July 13th, I photographed my first wedding. It was a lot lower stress than it could have been, because I was there as a strictly unofficial photographer for a ceremony that had been put together over the course of less than a week. I wasn't even sure if my schedule would permit attending until a few hours ahead of time. With no official duties as photographer, I was spared the stress of making sure I had reflectors, casing out the wedding location, conferring with bride and groom and family, etc. etc. etc. I had no control over anything, so could simply take pictures as I found them and hope for the best! The conditions were very challenging -- a sunny afternoon with intense light and shadows in an outdoor setting. Very nice for the bride and groom, but difficult for portraits. This was my favorite of the day: the First Kiss after the declaration of marriage. 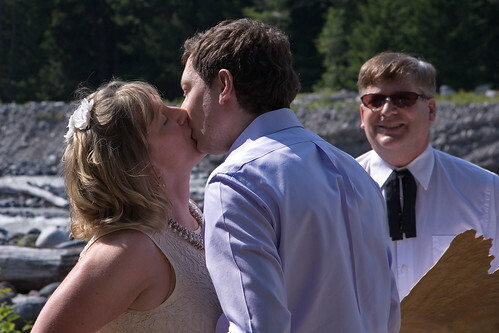 The shadows aren't too harsh, and I love the shallow depth of field, with the officiant in the background (holding a clipboard made out of a piece of unsquared wood) just out of focus enough to not be too distracting. But I love his smile back there, representing the good will of all of us in attendance.